Now for iPhone / iPod also! Download a copy of the Atomic Mac/PC right now, to try out without obligation! The cost of buying The Atomic Mac/PC is only $24.99! The Atomic Mac/PC is the award winning periodic table of the elements for the Macintosh. In addition to the usual information found in such programs, The Atomic Mac/PC also contains a wealth of nuclear information on each isotope, including half life, decay mode, and daughter products. No other periodic table of the elements has more data than The Atomic Mac/PC! We're so sure that you've find the Atomic Mac/PC the most useful periodic table of the elements that we're offering you a risk-free deal. You can go ahead and download a demo copy of the Atomic Mac/PC for absolutely free. Give it a try, see how information packed and easy it is to use. Once you've decided that you find it useful, go ahead and register your copy for just $24.99. If for some reason you decide the Atomic Mac/PC isn't for you, just throw away your copy. That's it! X-ray data (fluorescence and binding energies) is included, as well as photon interaction (mean free path) values. Electron shell information and alpha particle energies are also listed. In addition you can view the visible spectra, and get a table of wavelengths and relative amplitudes. Just click on one of the elements in the periodic table. 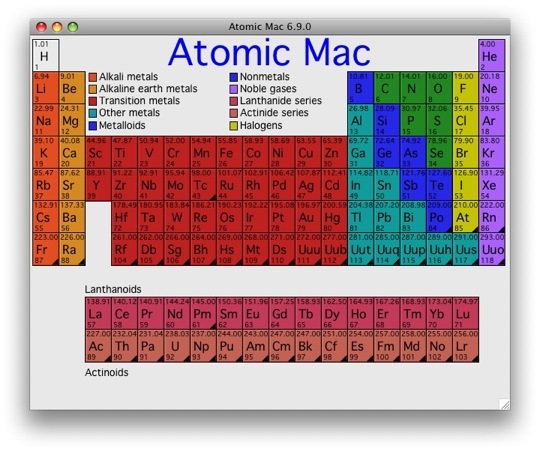 The Atomic Mac/PC is the most complete software periodic table of the elements you can find. There's a handy chart of the nuclides, showing all of the isotopes included in the Atomic Mac/PC periodic table, about 1600 of them! Clicking on one takes you to detailed data for that isotope, such as half life, decay mode, alpha/beta/gamma energies, and daughter products. A molecular weight calculator makes it easy to find the molecular weight of compounds. A shaded diagram showing the ranges of physical properties makes it easy to visualize relationships across the periodic table. This periodic table software features the Periodic Spiral display, which is an alternate way of arranging the elements. Version 6 of the Atomic Mac/PC periodic table of the elements is a Universal Binary for both Intel and PowerPC based Macs, and runs under OSX 10.2 thru 10.5.x. Take a look! The latest version of the Atomic Mac/PC is 7.0.0, and is a 64 bit application. You may also wish to take a look at iUnit - which converts between over 300 units of measurement. Save $5 by registering Atomic Mac/PC in conjuction with iUnit (A unit conversion program) for only $39.99!